Online books, journals, websites, databases, and other resoruces to support educational programs and research in the Tulane University School of Public Health and Tropical Medicine. Short videos on PubMed features. PMC is a free archive of biomedical and life sciences journal literature from NIH. Controlled vocabulary used for indexing articles for MEDLINE/PubMed. Also used in the Library Catalog. Field identifiers are special codes used to search within a certain field of PubMed. Example: searching a state within the Affiliation field will identify publications from a specific location. Select Send to - Citation Manager. Click the radio button for Citation manager, and then click the Create File button to download a citations.nbib. Import the nbib file into your citation manager software. My NCBI retains user information and database preferences to provide customized services for many NCBI databases. 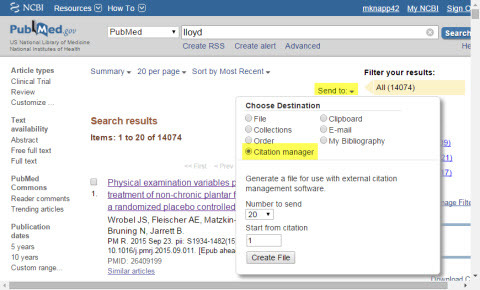 It is fully integrated into PubMed: save searches, organize your search results into collections, create a bibliography, remember previous search histories, and set up alerts for saved searches.